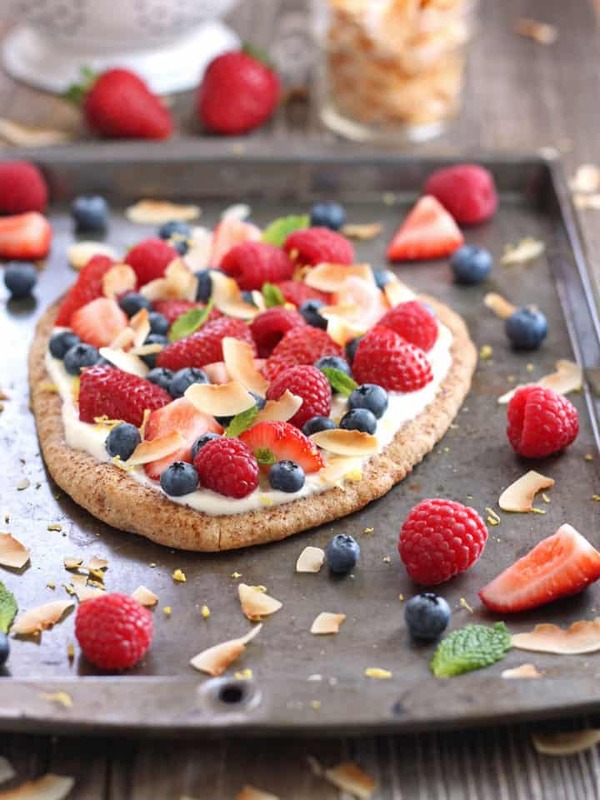 Easy Flatbread Fruit Pizza. 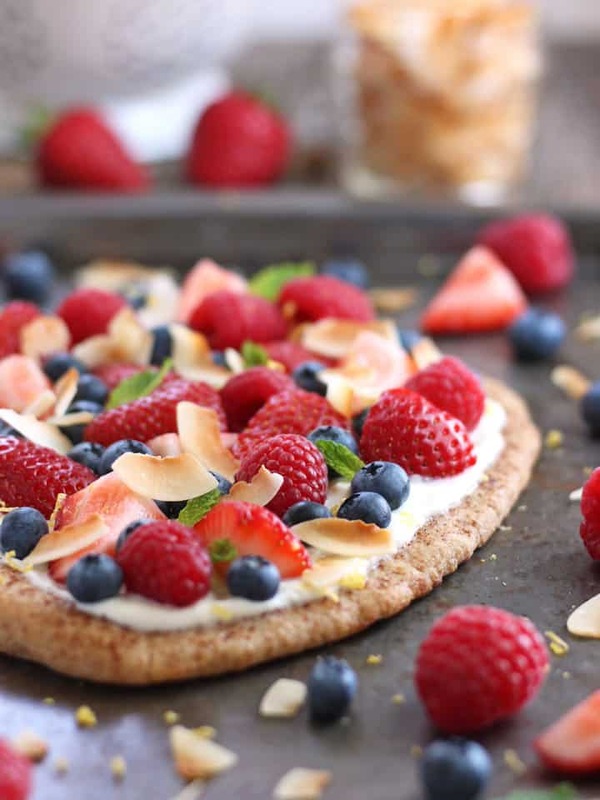 A semi-homemade toaster oven treat made with whole wheat flatbread, creamy lemon ricotta, fresh berries and toasted coconut. Perfect for breakfast or dessert! The hardest part = you’re toasting flaked coconut. Yup that’s the hard part! Otherwise we’re just adding a little spice to plain whole grain flatbread. A touch of sweet and pop of lemon flavor to creamy ricotta. And the berries, seriously they are so fantastic right now they don’t need anything. Just like with our Veggie Hummus Flatbread I had to make this a few times to get the ratios right. Too much ricotta and you get a creamy mess. Overdo it on the lemon curd and you’ll easily overpower the delightful flavor of your fresh berries. Salt on the flatbread? Jarred lemon curd can be very sweet (almost cloying). A tiny pinch of salt sprinkled on the flatbread balances out the sweetness to an enjoyable level that leaves you tasting more lemon than sugar. The toasted coconut is completely optional (really isn’t everything since this is your flatbread!) but I think it adds a nice crunch that contrasts the creamy ricotta, chewy naan and juicy berries. 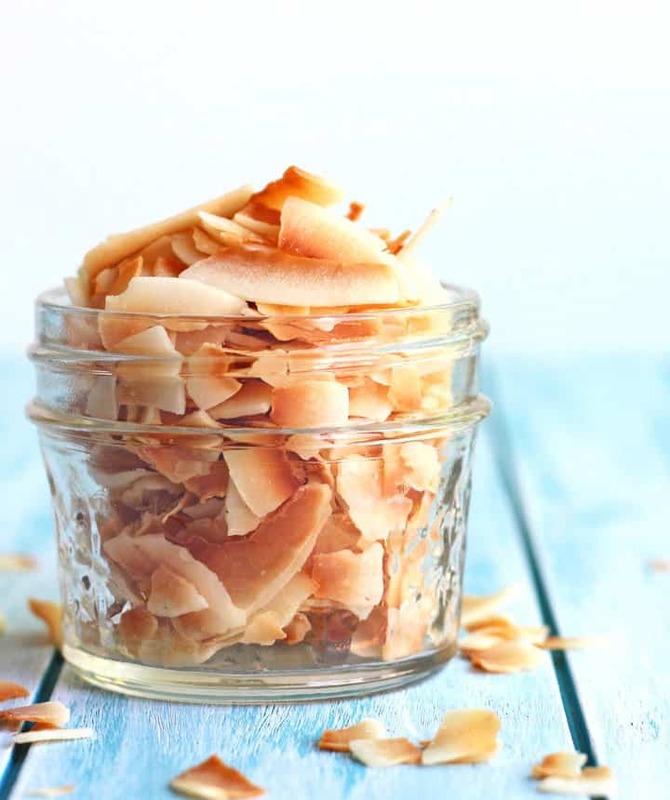 If coconut isn’t your jam you might enjoy toasted sliced almonds or chopped pistachios instead. 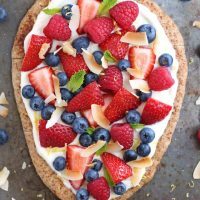 A semi-homemade toaster oven treat made with whole wheat flatbread, creamy lemon ricotta, fresh berries and toasted coconut. Perfect for breakfast or dessert! Preheat your toaster oven to 325 F.
Spread coconut in a single layer on a rimmed cookie sheet or pan. Toast for 3 to 6 minutes until lightly golden. Remove coconut and set aside to cool, increase the toaster oven temperature to 400 F.
Brush the top of the flatbread with coconut oil and sprinkle with cinnamon and salt. Bake the flatbread at 400 F for 7 to 8 minutes until golden and crisp on the edges. Remove the flatbread and cool completely before topping (about 5 minutes). While the flatbread cools whisk together the ricotta and lemon curd until smooth. To assemble the pizza: slice the flatbread into six pieces but do not separate the slices. 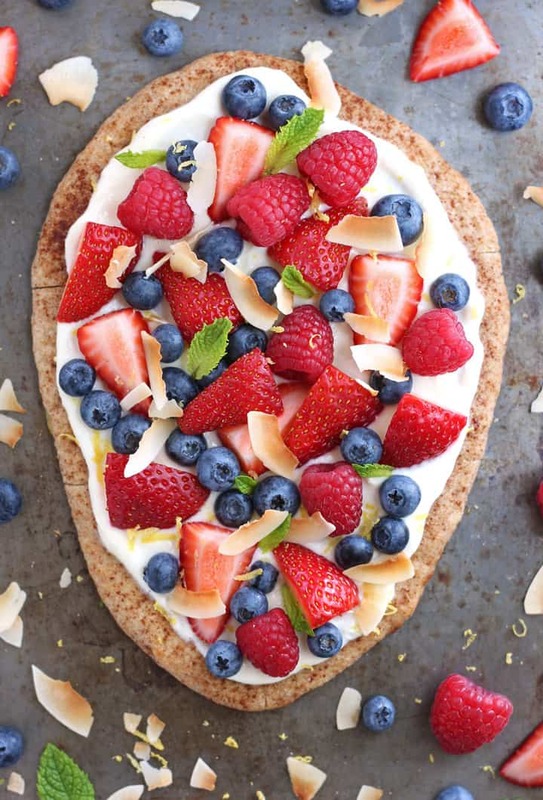 Spread ricotta mixture onto the flatbread and top with berries, coconut, lemon zest and mint. Before serving gently run your knife through the previous cuts in the flatbread. Serve immediately and enjoy! Prepared lemon curd can usually be found near the jams and jellies at your local grocery store. Step-by-step directions for How to Toast Coconut in Your Toaster Oven. 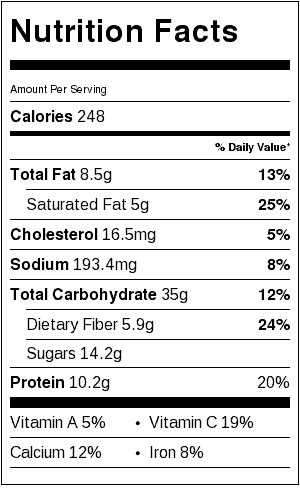 Nutritional information is an estimate for 1/2 of the fruit pizza. Disclaimer: This post contains amazon affiliate links for some seriously tasty Unsweetened Flaked Coconut, this means that if you click a link and decide to purchase Toaster Oven Love will receive a small percentage of the total price at no extra cost to you and you can put toasted coconut on EVERYTHING! 🙂 If you need more info check out our Disclaimer & Commitment to Honesty. that looks DELICIOUS! how beautiful and festive and fun! great idea and nice execution.